Victoire de Blake 3/6 7/5 1/0(7/4) face a Andre. La qualité de tennis de ce match fut très bonne. Andre n'avait pas touché une raquette depuis un mois mais il a montré que sans ses problèmes physiques, il avait toujours sa place parmi l'élite. Prochaine exhibition ce soir face à Andy Roddick . NORFOLK - The event featured America's No. 1 player and the world's No. 1 doubles team. But there was no doubt who Anthem Live's No. 1 attraction was Thursday at the Constant Center. "How many people think James Blake's ball was good?" asked public address announcer Wayne Bryan, polling a near-capacity crowd. A smattering of applause followed for Blake, the top American and the No. 4 tennis player in the world. "How many people think the ball was out?" The near-capacity crowd went nuts. 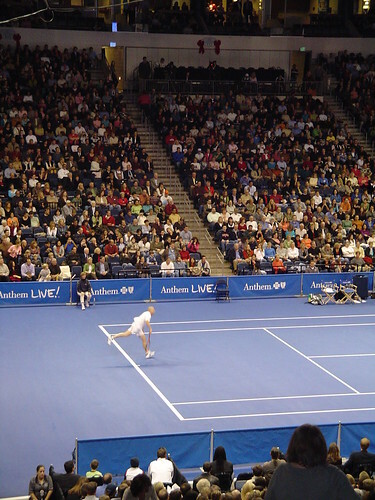 Point Andre Agassi, which later led to game Agassi. By night's end, maybe it wasn't match Agassi - Blake squeaked out a third-set tiebreaker - but it might as well have been. It was Blake's cause - a fund-raiser to benefit cancer research that raked in more than $450,000. But as fast as Blake was on the court, as well-spoken as the Connecticut native was earlier in the afternoon wearing a black velvet jacket, the day belonged to Agassi. It began with a $100-a-plate lunch at the Norfolk Yacht Club where Blake, Agassi and world No. 1 doubles duo of Bob and Mike Bryan charmed a crowd of 300. When Agassi was asked how much pressure his preschool age children faced given their lineage - mom is Steffi Graf, who stayed behind in Las Vegas - he quipped: "You haven't seen the rest of my family. It's a big gene pool." An auction followed with the feature item being one of Agassi's orange, white and black Head Flexpoint rackets. Bidding started at $1,000. Several spirited minutes later, Virginia Beach's Dennis McLaughlin claimed the prize for a cool $7,000. "Can I borrow that tonight?" Agassi joked. Sorry, but McLaughlin said this one, a gift for his wife, Jennifer, would likely wind up on the wall of his home. Agassi's racket turned up later that afternoon when he and Blake greeted 14-year-old Roy Flemmer. An avid tennis player, Flemmer was stricken with Ewing's Sarcoma, an extremely rare form of cancer in his forearm. An 11-hour surgery in July took bone from his leg and replaced the bone where the tumor was in his arm. Flemmer is now undergoing 14 cycles of chemotherapy. After chatting with the players about the movie "Dodgeball" and Nintendo tennis, Flemmer produced his racket for Blake and Agassi to sign. "I brought you a better one," said Agassi, unveiling another Flexpoint for a stunned Flemmer. "Use that," Blake advised, "and you'll hit your backhand just like him." Blake warmed up his backhand in a surprising manner - with 6-year-old Colby Worden of Norfolk, whose family had bid $2,200 for the privilege. The youngster, who takes lessons three times a week, looked comfortable trading shots with Blake, uninhibited even when Agassi snuck behind him. In addition to their friendship with Blake, each of the players had personal reasons for getting involved with Anthem Live. The Bryan brothers have an uncle diagnosed with prostate cancer; Agassi has a mother and sister who are breast cancer survivors; and Blake champions the cause as a tribute to his father, who died of cancer in 2004. "It touches everybody on the planet," Agassi said. Boyd Tinsley of the Dave Matthews Band also offered support, playing the national anthem on violin and then teaming with Blake for doubles. A battle of brothers followed with Blake and his older brother, Thomas, pitted against the Bryans. Then came the main attraction. Earlier in the day when asked if he might accidentally hit a ball boy with his serve, Agassi said, "I don't know where it will go." Since his retirement in September after the U.S. Open, he has played sparingly, resting a sore back. But it took just two points before the vintage Agassi form - which won him eight Grand Slam titles - kicked in. Blake envisions returning to Norfolk for many more nights like this one. 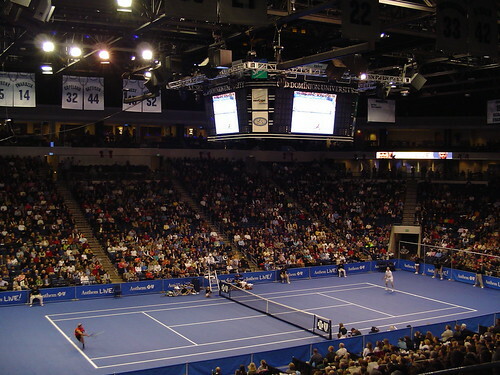 As for Agassi, he may have joked about not being able to pronounce Norfolk, but he insisted he enjoyed his short stay. Judging by the ovations showered upon him, so did everyone else.